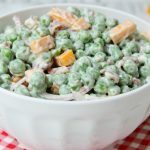 Easy Pea Salad – A summer salad perfect for potlucks and gatherings. 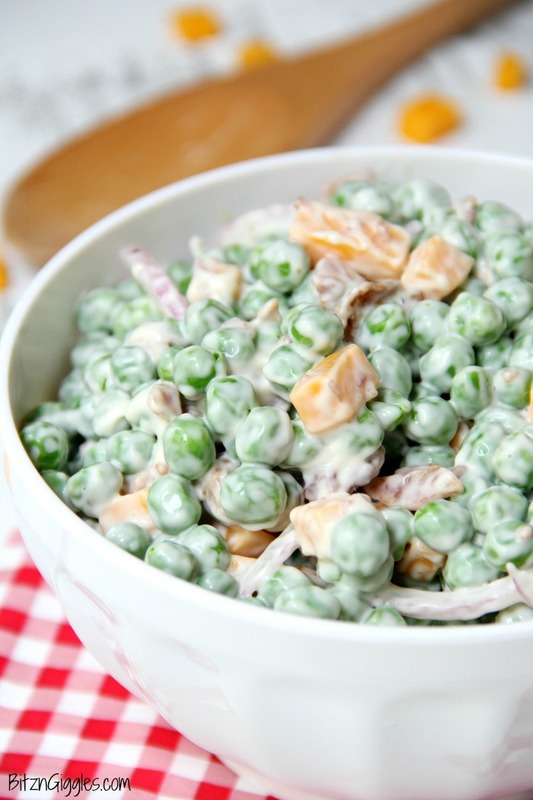 Crisp green peas float alongside bacon, cheddar cheese and thinly sliced red onion in a sweet and creamy dressing. I know it’s not technically summer yet, but it sure feels like it! I prepare for the weekends by making pasta salads and no-bake desserts. I’m not sure it gets any better than that. If you make a lot of pasta salads in the summer, too, you’re going to love this Easy Pea Salad. It’s a little different from your typical pasta salad but still a classic summer dish you’re going to find yourself making again and again. 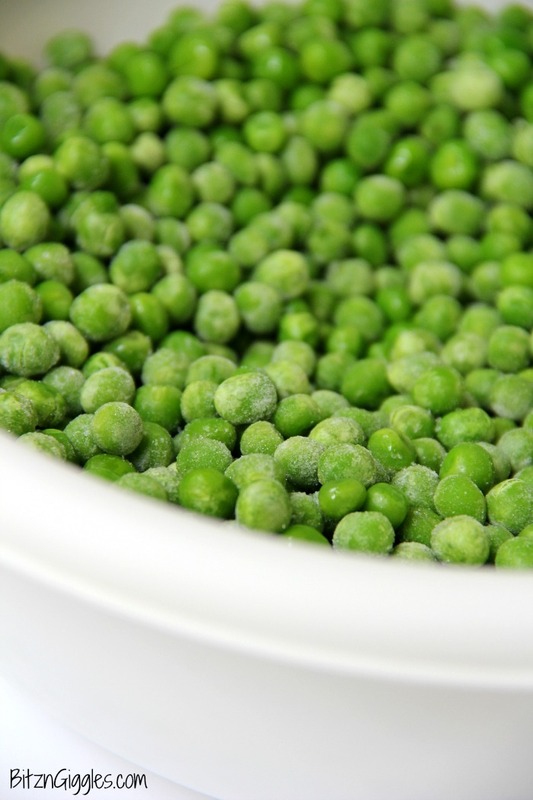 It all starts with frozen peas. I just thaw them slightly for this recipe. I find that the peas stay nice and firm during the mixing process when they’re a bit frozen yet. The creamy dressing that ties everything together is a recipe my family uses for all sorts of things from pasta salad to potato salad. It really is our go-to dressing for summer salads. 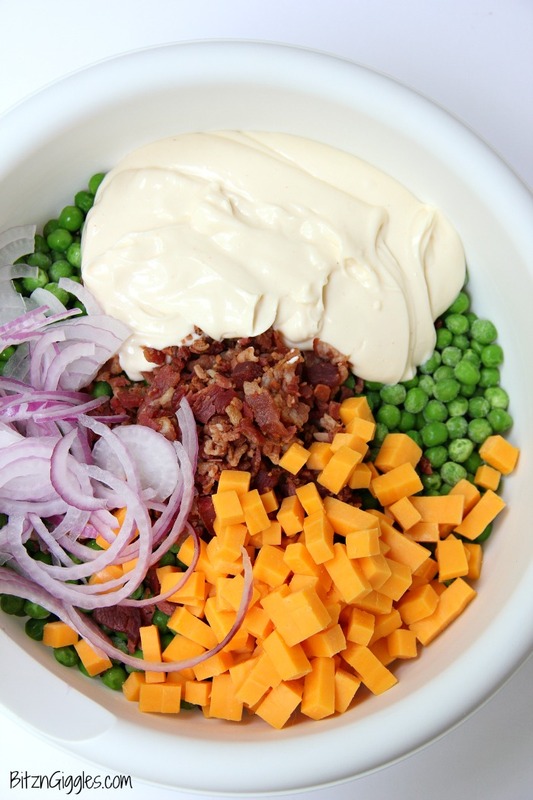 Once the dressing is ready and the peas are thawed a bit, you mix everything together with bacon, cheddar cheese cubes and thinly sliced red onions. I cheat and use the pre-packaged bacon pieces, but you could also cook your bacon and crumble it into pieces, yourself. I let the salad chill in the fridge for at least an hour after preparing it. It gives the peas more time to thaw and helps the flavors meld together. This easy pea salad disappears at parties. Like I said before, it’s a bit different than your traditional pasta salad and tastes both fresh and flavorful. Go ahead and experiment with different cheeses if you’d like. I used sharp cheddar but you could try just a mild cheddar. 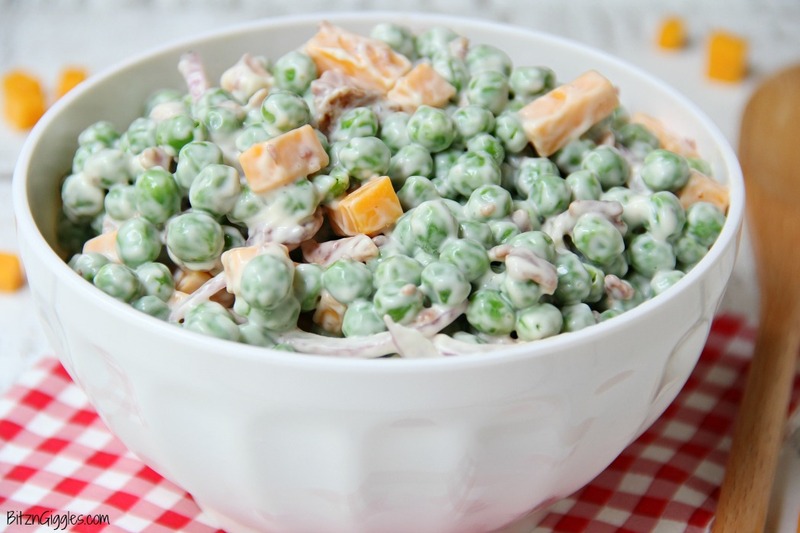 Welcome in summer with this easy pea salad. You AND your guests will be happy you did! A summer salad perfect for potlucks and gatherings. 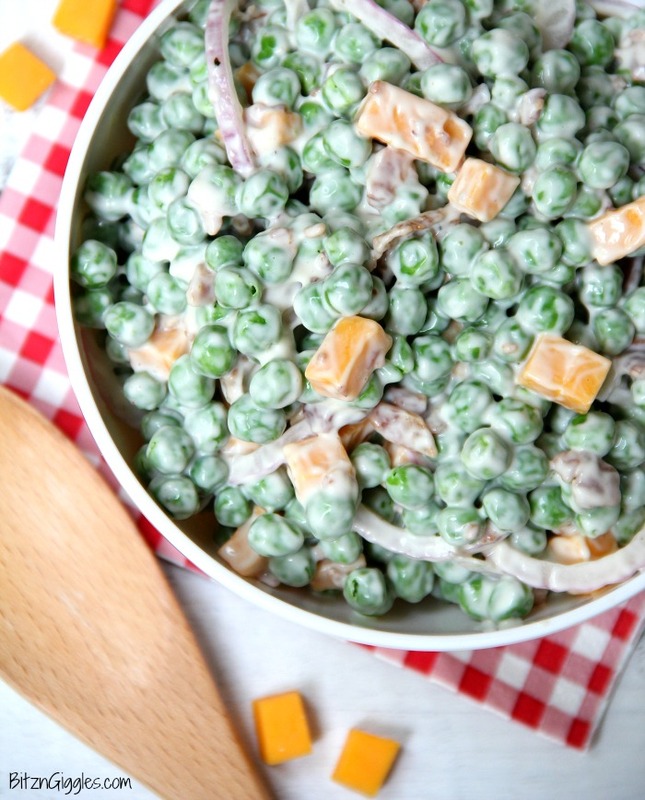 Crisp green peas float alongside bacon, cheddar cheese and thinly sliced red onion in a sweet and creamy dressing. Add first four ingredients to large bowl. 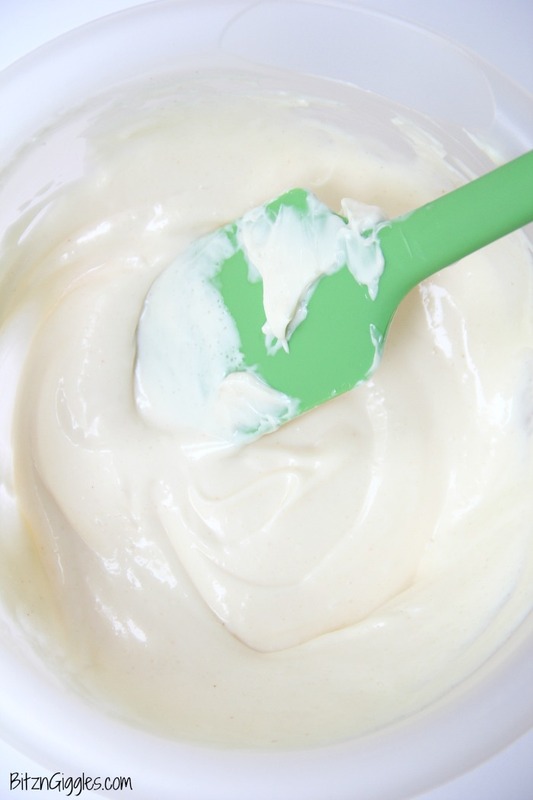 In a separate bowl, mix together Miracle Whip, milk and sugar to create a creamy dressing. Add the dressing to the large bowl and stir to combine. You could also use mayonnaise. Just use a little bit more sugar in the recipe.